Welcome the Chapter 5 of our Ultimate Guide to Increasing Reader Engagement on Disqus! Catch up on the most recent chapter on promoting comments on external channels. Thanks! A highly engaged audience can be a your most valuable asset. In this chapter, we’ll explore strategies for fostering loyalty from new readers and retaining your most valuable audience members through incentives and recognition. When featuring a comment, the comment is pinned to the top of the discussion. Commenters are notified when a comment they posted is featured by the site, closing the feedback loop for their interaction. Not only does featuring top comments recognize readers’ contributions, it leads to a boost in engagement. 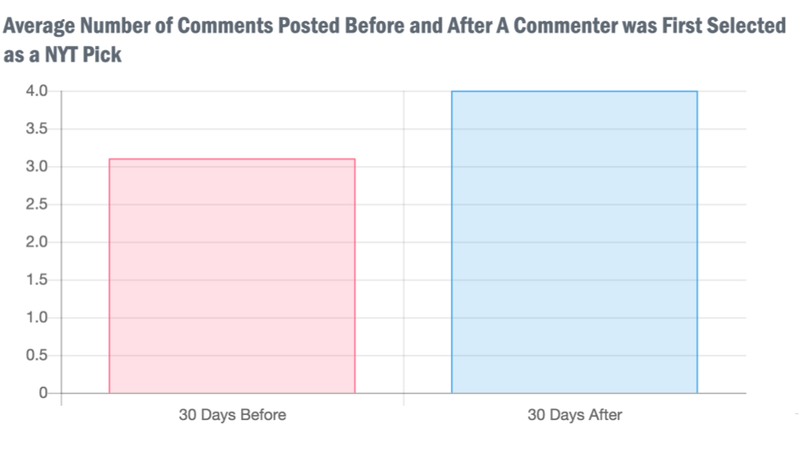 In a study conducted by the Center for Media Engagement examining comments posted on The New York Times, they found that users whose comments were selected as “NYT Picks” resulted in an increase in commenting behavior. Comments were selected by the moderation staff that contributed to the discussion, such as by steering the discussion in a productive direction or adding new information to the story. If a commenter inspired a story idea with a thought-provoking question, take the opportunity to mention them directly in the story. Embedding their comment is simple and places higher visibility into the ongoing discussions happening across the community. If you have an idea of who your top contributors are but would like to discover more, visit the Top Commenters tab on your site’s comments section. Just select your site’s name next to the comment count and switch to the Top Commenters list to see the readers that have contributed the most to discussions. This is also a good opportunity to visit their user profile to learn more about the communities they frequent as well as their areas of interest. Once you’ve identified your top contributors, one of the easiest methods for recognizing them is to interview them. 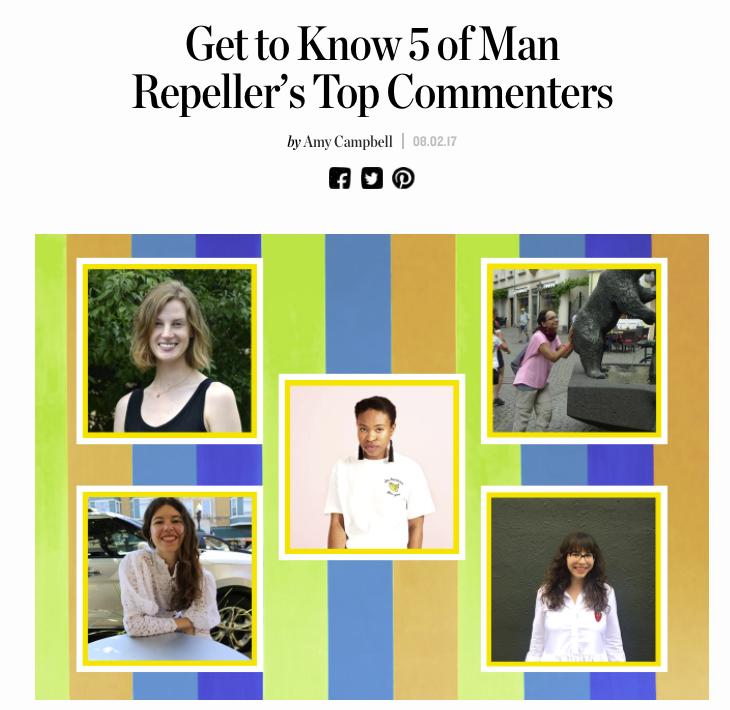 On Man Repeller, a fashion site for women, they interviewed five of their most prolific commenters and featured them on the site. These incredible stories brought color to the voices that make their comments section feel vibrant and friendly every day. To see more examples like this, check out this profile from The New York Times and our own Commenter Spotlight series that featured commenters from communities all across the Disqus network. As readers ascend the ranks into becoming highly engaged and loyal readers, empower them to take on leadership roles. By doing so, you begin to shift some of the work of managing a growing community to the community itself. This could include things like onboarding new readers, moderating comments, and referring new readers. By tapping into this group, you’ve designed a path towards scaling your community to new heights. One tactic to empower readers is to add those with a track record of posting high-quality comments to your Trusted Users list. Trusted Users have the benefit of being able to post on discussions more freely without requiring moderation review. Not only does this reduce your moderation time by prioritizing your effort, this recognizes these readers for their contributions to your site and creates a model for other readers to aspire towards. At Stack Overflow, developers share their knowledge and help each other learn programming. New members start with limited access to capabilities like voting, editing, and moderation. By answering questions effectively, supporting other members, and otherwise being a great citizen, members earn additional privileges over time that empower them to support the community in more impactful ways. Today, this model has propelled Stack Overflow into becoming one of the largest Q&A sites on the web spanning topics that go far beyond just programming. By aligning incentives early on to support behavior that benefits the entire community, this helped scale their growth as more users joined the community, without diminishing the quality of the content. In the final chapter in our guide to increasing reader engagement, we’ll talk about optimizing the commenting experience on your site. Subscribe to our blog to get notified when it’s available. 💬 Tell us how you plan on empowering your most engaged users to scale the growth of your community.